Well hey there, hi there! Has the craziness of Christmas set in yet? We’re five days out, and boy am I excited! I just got back to Ohio, and I have officially hit the ground running. I got off the plane and basically went straight over to church to help decorate. It’s a wonderful and festive…cauliflower flatbread!!! Yes – you read that correctly: a crust made out of cauliflower. I always call the humble cauliflower my kitchen superhero, because it is so versatile. I’ve made breads, crusts, alfredo sauce, rice, mashed potatoes, soups, steaks, poppers, all out of the humble white crucifer. 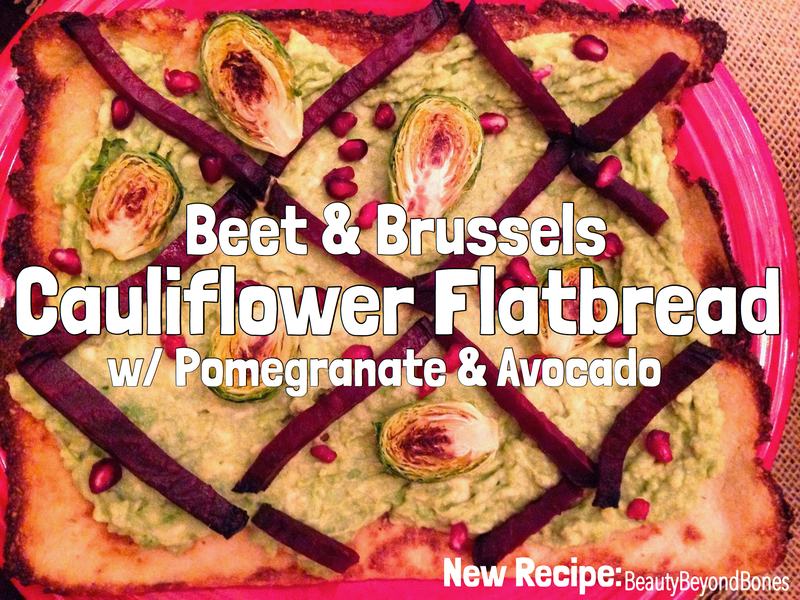 This is a Beet and Brussels Sprouts Cauliflower Flatbread with Avocado and Pomegranate Seeds! Incredible. And it was Grain and Gluten Free, Specific Carb Diet Friendly, and Paleo, with a Vegan option! I made enough for two flatbreads…one for me, and one for everyone to sample. It was a hit, lemme tell ya! Preheat oven to 400 degrees Fahrenheit. Break the cauliflower into florets and place in the food processor. Process until it resembles rice. Then, place the cauliflower rice in a clean kitchen towel, paper towel, or cheesecloth and wring out all the excess liquid. This is a really important step!! Then, place your wrung-out, dry cauliflower rice into a mixing bowl with the almond flour, egg whites, and salt. Stir to combine. Divide this “dough” in half. Cut four pieces of parchment paper. Place half of the dough onto one sheet of parchment. Place another sheet on top and “smoosh” out the dough until it is rather thin. (It should be the size of a dinner plate.) Repeat with the other half of the dough. Place the two “parchment sandwiches” onto two baking sheets and bake for about 20-25 minutes, until the edges turn golden brown. Meanwhile, prep the rest of the veggies. Scrub and dry the beets and cut them into 1/4 inch rounds. Place the rounds on a tin foil – lined, olive oil sprayed baking sheet. Spritz with olive oil and sprinkle with salt and pepper. Bake for about 40 minutes in a 400 degree oven, flipping once halfway though. Finally, cut the brussels sprouts in half, lengthwise – through the core. In a large frying pan, place them in a single layer, cut-side-down in 1 Tbsp EVOO. Sprinkle with salt and pepper. Let them cook, untouched, for about 7 minutes over medium heat. Then, flip and allow to cook on the other side for about 4 minutes. Remove from heat and set aside until you’re ready to assemble. When you’re ready to assemble the flatbreads, mash two avocados with salt, and cut the roasted beet rounds into matchsticks. Spread half of the avocado onto each of the flatbreads. Leave about 1 inch of a border. Then, place the brussels sprouts and beets on top. Garnish with about 2 Tbsp of pomegranate seeds. Serve room temperature. E-gads! This was a meal for the record books! It was seriously the hit of the supper. So delicious. It’s hard to believe that the crust was made out of cauliflower. Here’s a testament to how delicious it was: I made an extra one for everyone to have a piece. Now my dad and brothers are all big meat eaters. (They’re Atkins guys.” And they loved it. Seriously. Not a “pity” like, but a straight-up, genuine, Facebook-endorsed “like” of my meal! The flavors were so unique and wonderful. The avocado was buttery and rich, with the nutty and chewy crust. (You really could pick it up like a slice of pizza!) And then the beets had an earthy sweetness that paired beautifully with the savory brussels sprouts. Finally, the pomegranate seeds provided this interesting burst of juicy sweetness that rounded everything out. And best of all, it was truly beautiful! 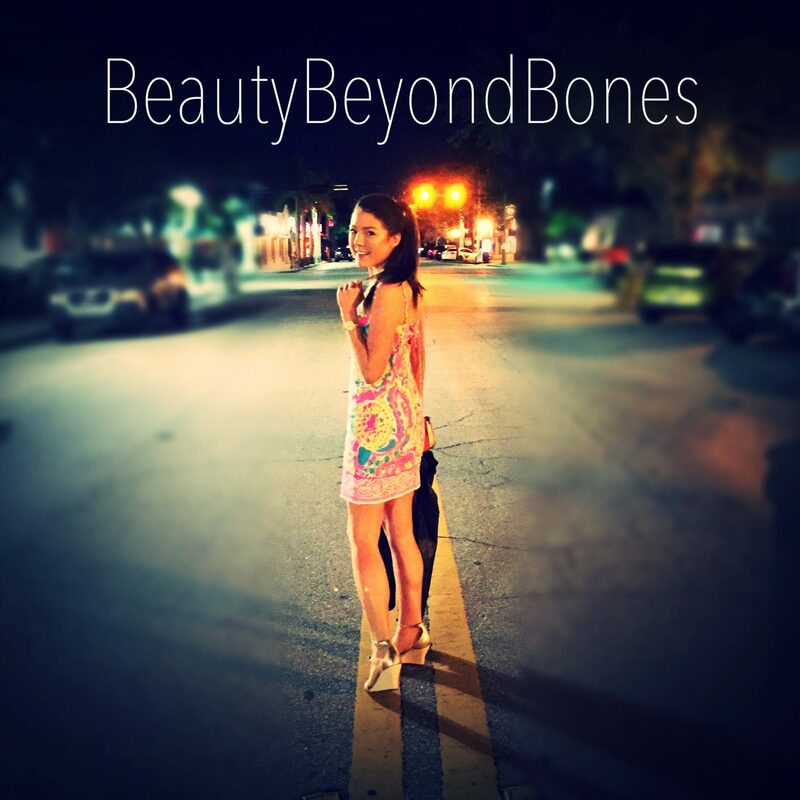 I made one “artsy” – with an argyle-like design. And my personal favorite was a more “rustically fabulous” presentation. My family said they could see this being served at a restaurant. It looked like Christmas on a plate, with the lime green and and crimson. It could have been the backdrop of a Christmas card! Well, that’s all for now. Back for more programming as usual tomorrow. But in case I miss ya, I truly hope that you have a wonderful holiday. Christmas is such a special time of year to be with the people you care about. And I hope that you all know how much I care about each one of you. Cheesy, but true. Fantastic! I’ve got to try that! Well! If you like this, you’ll love the recipe for brie tart! Method: 1. Bake pastery shell “blind” to harden for 10 minutes at 425*. Cool. Reset oven to 375*. 2. Remove the rind from chilled cheese and cut the rind into small pieces with moistened knife. Reserve. 3. Beat softened brie cheese, yokes, ginger, brown sugar, saffron, and salt until smooth. 4. Pour into pastry shell. 5. Strew cut rind evenly over surface of the pie. 6. Combine cinnamon with white sugar and sprinkle around pastry edge. 7. Bake until set golden brown, about 30 minutes or less. Serve warm or cold. Happy almost Christmas! 🎄I was just wondering if the crust is textured like cauliflower mash or is it just like regular crust? Beautiful church, delicious looking food! Very unique! Merry Christmas! This sounds delicious! Thanks for the vegan option! You’re quite welcome! I’m saving your blog post so I can try it! Looks so good!!! And it’s so colorful!!! 🙂 Thanks for sharing. And your church decorations are beautiful!!!! This looks yummy! I’m really keen to try it! Thanks! Don’t know about this one young lady. Just looking w/out tasting, you are going to have to go to the hard sale on me. Looks fab! Reminds me of Yotam Ottolenghi peculiar recipe Cauliflower Cake, which I can highly recommend if you Google it! Love the funky and the festive! Very inspiring I will try that recipe next year!